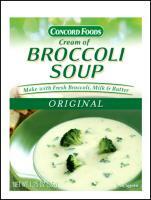 Delicious homemade soup you can prepare in minutes using this rich, creamy soup base and fresh tender buds of broccoli. Just mix contents of 1.25oz package with milk and cook. Add broccoli and simmer. Serve immediately.